The PHA-90, PHA-89, PHA-85, and PHA-100 model has been discontinued. Please see the PHA-4 Series as a possible alternative or contact our Flow Engineering department. 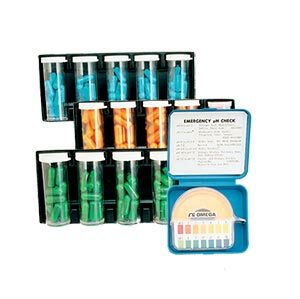 For quick preparation of fresh buffer solutions, these color-coded buffer capsules make 100 mL of standard buffer solution accurate to within ±0.02 pH. Available in three pH ranges, each package contains five vials with ten capsules in each. This color-coded buffer pack has two vials, each containing ten capsules of different pH value, four of pH 4.0 (red), four of pH 7.0 (green) and two of pH 10.0 (blue). All values are accurate to within ±0.02 pH. Indicator Paper (1/2" tape) The dispenser contains one 15 meters (50 ft) roll of pH paper and a color comparison chart; measures pH from 0 to 13 in 1 pH unit increments.